For 2019, my Focus Word is Dedicate. I plan to Dedicate myself to using what I already own, enjoying what I already have, focusing on the hobbies I already love, nurturing the relationships I already am in, and giving my all to my existing business and professional projects. The focus is more about enjoying the old than bringing in the new. And that feels just right this year. When I posted on social media about this Focus Word approach, I got a huge response to my appeal for people to share their Focus Word of the new year. People's comments were very inspiring and thought-provoking. Interestingly, people often share that they experience a little resistance to their word at first. Or were surprised at their word. Or hoped that something bigger or better had come to mind. Try not to resist the word that presents itself to you! The word you choose is usually the exact one that you need to be reminded of throughout the year. And by the way, the Focus Word approach is not a cop out! It doesn't mean that you won't accomplish anything or fail to take action. From what I have seen with the Focus Word approach, you will. But many of us don't need another to-do list. We need a focus, a rallying cry, a mantra, an affirmation, a reminder. Your Focus Word can serve all of those purposes and more if you give it some serious thought, choose wisely (or better yet, let your word choose you! 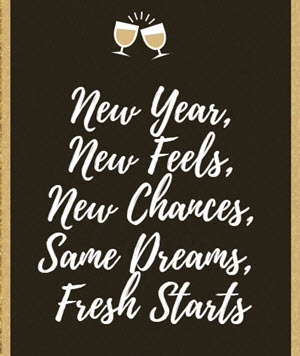 ), and then keep that word front and center in your mind, guiding your actions and behavior during the year. So ... what is your Focus Word for 2019? I'd love to hear it. Please send me an email or even better, share in the comments section below so others can be inspired too! Happy New Year!I am a big fan of J.K. Rowling’s Harry Potter books. I have read all seven of them, and each time a new movie version premieres, I make it a point to re-read that book before seeing the accompanying movie. Therefore, at this time, I am re-reading the sixth book in the series, Harry Potter and the Half-Blood Prince, which is currently showing in theaters. In Half-Blood Prince, the sixth-year students at Hogwarts are taking lessons in apparition. Apparition is a magical form of teleportation, through which a witch or wizard can disappear (”disapparate”) from one location and reappear (”apparate”) in another. During the lessons, the instructor outlines the 3 D’s of apparition: Destination, Determination, and Deliberation. When I read the 3 D’s of apparition, I couldn’t help but think that there is a strong parallel to the principles of organizing. Let me demonstrate. If you are about to embark on an organizing project, you need to first think about your organizing goals, i.e., your Destination. If a physical organizing project, you can do this by visualizing what the space will look like after you have organized it. Visualize your home or office without the piles of clutter. If your organizing project is not physical, then you can envision what you will feel like once the project is accomplished. Visualize your calendar with less tasks in it. Hold onto that visualization in your mind. Thinking about your Destination is a powerful motivator to help get you there. In my 6-step organizing approach, DECIDE®, the first step is Discover. Like Destination, it is the stage when you think about what you want in your home, work, and life, and how being better organized will serve you and your goals. In order to succeed with your organizing projects, you need to practice Determination. When you are determined, you are more likely to prepare for success. What type of Determination do you have? Have you created an accountability partnership? Have you hired a professional organizer to assist you? Are you willing to make the time and exert the effort that it takes to make organization a reality? With Determination, you will make time in your schedule to organize, and will break down the organizing project into small manageable portions in order to stay focused and motivated. In my DECIDE® process, the 5th step is Dedicate. Just like with Determination, you must dedicate yourself to becoming organized, and staying that way once you have achieved your desired goal. Lastly, you must act with Deliberation when you want to get organized. To be deliberate when organizing means that slow and steady wins the race. You need to take each action with an eye toward whether it makes sense for you. In the DECIDE® process, the 4th step is Implement, during which you design organizing systems to match your habits, needs, work, and lifestyle. You need to carefully consider each step along the way, and be deliberate so that the system can be maintained for the long haul. If the system is deliberately tailored to you, you will be more likely to maintain it. 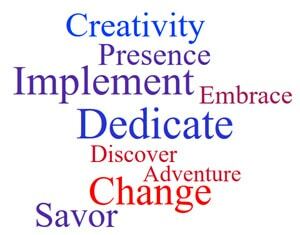 So when organizing, think of the 3 D’s of apparition from Harry Potter: Destination, Determination, and Deliberation. They are useful tools for accomplishing your organizing projects. And, of course, if all else fails, you can always try to “disapparate” your clutter! Copyright © 2009 Lisa Montanaro of LM Organizing Solutions, LLC. You can, as long as you use this complete statement: Copyright 2009. 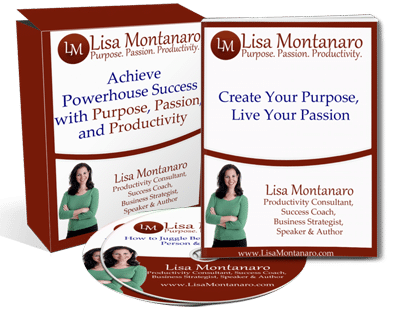 Lisa Montanaro is a Productivity Consultant, Success Coach, Business Strategist, Speaker and Author who helps people live successful and passionate lives, and operate productive and profitable businesses. Lisa publishes the monthly "DECIDE® to be Organized" e-zine for success-minded individuals, and "Next Level Business Success" e-zine for entrepreneurs. Subscribe today at www.LMOrganizingSolutions.com. Lisa is the author of The Ultimate Life Organizer: An Interactive Guide to a Simpler, Less Stressful & More Organized Life, published by Peter Pauper Press. Lisa also publishes the DECIDE® to be Organized blog at www.DecideToBeOrganized.com. Through her work, Lisa helps people deal with the issues that block personal and professional change and growth. To explore how Lisa can help take your business to the next level, contact Lisa at (845) 988-0183 or by e-mail at Lisa@LMOrganizingSolutions.com.There's still time to DECIDE to be Organized! The 6-week group coaching program starts tomorrow night, October 6th, and runs until November 10th. I have a great group of participants already registered that are ready to work, share, and make changes to their homes, offices, and lives. Come join us! Why a Group 'Coaching' Program? Coaching is designed to assist individuals in creating and implementing specific action plans. Coaches use advanced communication skills to help the client create a successful personal and professional life. As a trained mediator, I guide clients to successful results through motivation and encouragement, without judgment. The focus is on asking skillful questions designed to help participants define and achieve their goals. But don't worry! I do more than ask questions. I will also have my certified professional organizer 'expert' hat on throughout the program, offering tried-and-true tools and tricks based on my 7 years of experience working with hundreds of clients to overcome their organizing issues. Each week, you will get 90 minutes of information-packed instruction, along with Q&A. Participants can ask me their questions and get personalized, informative, and effective answers. During the teleclasses, you’ll get an energizing combination of practical tips and suggestions, plus techniques to deal with the emotional side of disorganization and clutter. But don't take my word for it! Here is a testimonial from a past workshop participant: "I cannot tell you how you have really changed my life. I know it sounds corny, but I was in such a bad place before your workshop. You got me thinking of how to use your methods for every aspect of my life and what a difference! I must say, your workshop really helped me put things into perspective and prioritize my activities. I don't have to do it all at once. What a relief! It's amazing how organizing your life gives such peace of mind!" ~ Rosemary Reo, Putnam/Northern Westchester BOCES, Yorktown Heights, NY Are You Ready to DECIDE to be Organized? There will be 6 (six) 90-minute calls in a row on Tuesday evenings from October 6 to November 10, 2009, each starting at 7:30pm EST. Registration is only $199! 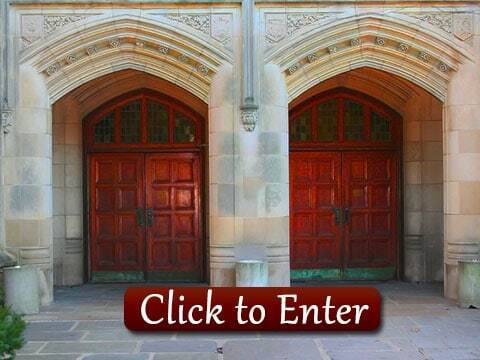 Enrolling is easy. Follow this link. You have nothing to lose -- except maybe some clutter, overwhelm, and stress!I am a big fan of J.K. Rowling’s Harry Potter books. I have read all seven of them, and each time a new movie version premieres, I make it a point to re-read that book before seeing the accompanying movie. Therefore, at this time, I am re-reading the sixth book in the series, Harry Potter and the Half-Blood Prince, which is currently showing in theaters. In Half-Blood Prince, the sixth-year students at Hogwarts are taking lessons in apparition. Apparition is a magical form of teleportation, through which a witch or wizard can disappear ("disapparate") from one location and reappear ("apparate") in another. During the lessons, the instructor outlines the 3 D’s of apparition: Destination, Determination, Deliberation. When I read the 3 D’s of apparition, I couldn’t help but think that there is a strong parallel to the principles of organizing. Let me demonstrate. If you are about to embark on an organizing project, you need to first think about your organizing goals, i.e., your Destination. If a physical organizing project, you can do this by visualizing what the space will look like after you have organized it. Visualize your home or office without the piles of clutter. If your organizing project is not physical, then you can envision what you will feel like once the project is accomplished. Visualize your calendar with less tasks in it. Hold onto that visualization in your mind. Thinking about your Destination is a powerful motivator to help get you there. In my 6-step organizing approach, DECIDE™, the first step is Discover. Like Destination, it is the stage when you think about what you want in your home, work, and life, and how being better organized will serve you and your goals. In order to succeed with your organizing projects, you need to practice Determination. When you are determined, you are more likely to prepare for success. What type of Determination do you have? Have you created an accountability partnership? Have you hired a professional organizer to assist you? Are you willing to make the time and exert the effort that it takes to make organization a reality? With Determination, you will make time in your schedule to organize, and will break down the organizing project into small manageable portions in order to stay focused and motivated. In my DECIDE® process, the 5th step is Dedicate. Just like with Determination, you must dedicate yourself to becoming organized, and staying that way once you have achieved your desired goal. Lastly, you must act with Deliberation when you want to get organized. To be deliberate when organizing means that slow and steady wins the race. You need to take each action with an eye toward whether it makes sense for you. In the DECIDE® process, the 4th step is Implement, during which you design organizing systems to match your habits, needs, work, and lifestyle. You need to carefully consider each step along the way, and be deliberate so that the system can be maintained for the long haul. If the system is deliberately tailored to you, you will be more likely to maintain it. So when organizing, think of the 3 D’s of apparition from Harry Potter: Destination, Determination, and Deliberation. They are useful tools for accomplishing your organizing projects. And, of course, if all else fails, you can always try to “disapparate” your clutter! There’s still time to DECIDE to be Organized! The 6-week group coaching program starts tomorrow night, October 6th, and runs until November 10th. I have a great group of participants already registered that are ready to work, share, and make changes to their homes, offices, and lives. Come join us! Why a Group ‘Coaching’ Program? Coaching is designed to assist individuals in creating and implementing specific action plans. Coaches use advanced communication skills to help the client create a successful personal and professional life. As a trained mediator, I guide clients to successful results through motivation and encouragement, without judgment. The focus is on asking skillful questions designed to help participants define and achieve their goals. But don’t worry! I do more than ask questions. I will also have my certified professional organizer ‘expert’ hat on throughout the program, offering tried-and-true tools and tricks based on my 7 years of experience working with hundreds of clients to overcome their organizing issues. Each week, you will get 90 minutes of information-packed instruction, along with Q&A. Participants can ask me their questions and get personalized, informative, and effective answers. During the teleclasses, you’ll get an energizing combination of practical tips and suggestions, plus techniques to deal with the emotional side of disorganization and clutter. Are You Ready to DECIDE to be Organized? There will be 6 (six) 90-minute calls in a row on Tuesday evenings from October 6 to November 10, 2009, each starting at 7:30pm EST. Registration is only $199! Enrolling is easy. Follow this link. You have nothing to lose — except maybe some clutter, overwhelm, and stress! I am a big fan of J.K. Rowling’s Harry Potter books. I have read all seven of them, and each time a new movie version premieres, I make it a point to re-read that book before seeing the accompanying movie. Therefore, at this time, I am re-reading the sixth book in the series, Harry Potter and the Half-Blood Prince, which is currently showing in theaters. In Half-Blood Prince, the sixth-year students at Hogwarts are taking lessons in apparition. Apparition is a magical form of teleportation, through which a witch or wizard can disappear (“disapparate”) from one location and reappear (“apparate”) in another. During the lessons, the instructor outlines the 3 D’s of apparition: Destination, Determination, Deliberation. When I read the 3 D’s of apparition, I couldn’t help but think that there is a strong parallel to the principles of organizing. Let me demonstrate. If you are about to embark on an organizing project, you need to first think about your organizing goals, i.e., your Destination. If a physical organizing project, you can do this by visualizing what the space will look like after you have organized it. Visualize your home or office without the piles of clutter. If your organizing project is not physical, then you can envision what you will feel like once the project is accomplished. Visualize your calendar with less tasks in it. Hold onto that visualization in your mind. Thinking about your Destination is a powerful motivator to help get you there. In my 6-step organizing approach, DECIDE™, the first step is Discover. Like Destination, it is the stage when you think about what you want in your home, work, and life, and how being better organized will serve you and your goals.